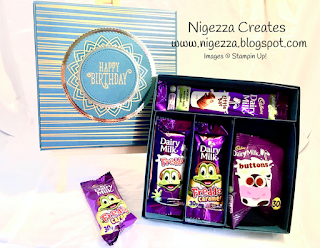 I was inspired to make this selection box after seeing a similar box on the Pootles Craft Forum, the person who posted it (Jacqui Stinson) does not do tutorials, so I thought I would have a go myself. Selection boxes are an absolute must for Christmas along with gold coins in a net bag! My kids, despite being grown men now, would feel let down and deprived if they did not have these under the tree! It is my youngest's 20th birthday in a few weeks so I decided to make this first (as I am sure I will be making more) box for his birthday. I went shopping for chocolate (its a chore I know but someone had to do it! lol) ASDA had several offer on and I bought 5 mini Cadburys selection for £1 - the box is designed for 4 so I got to eat one lol! 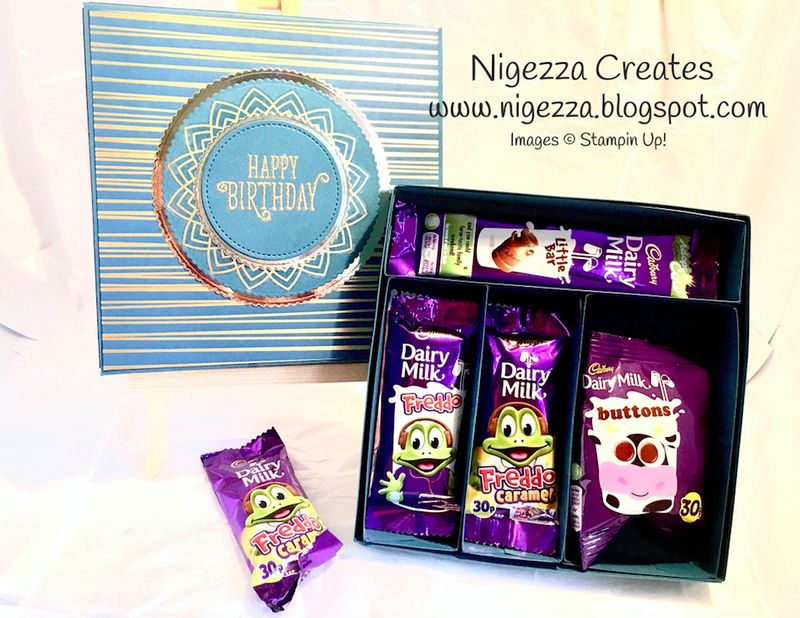 The construction of the box is pretty straight forward, its a lidded box, there are sections in the box for each chocolate bar that are constructed in the same way. The difficulty was in measuring the bars of chocolate (and not eating them!) and making them into an aesthetically pleasing square or rectangle. It would be easy to change the measurements to suit different size bars. ASDA also had an off on standard size bars, 2 for £1 so I stocked up for the boys Christmas selection boxes. Of course there is always the danger that I eat them! 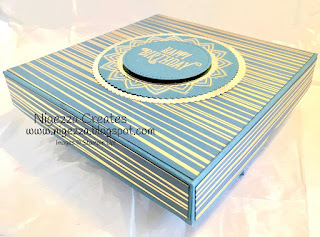 For this box I used Dapper Denim card stock and the lovely foiled sheet from Eastern Palace speciality DSP, a some gold foil card. 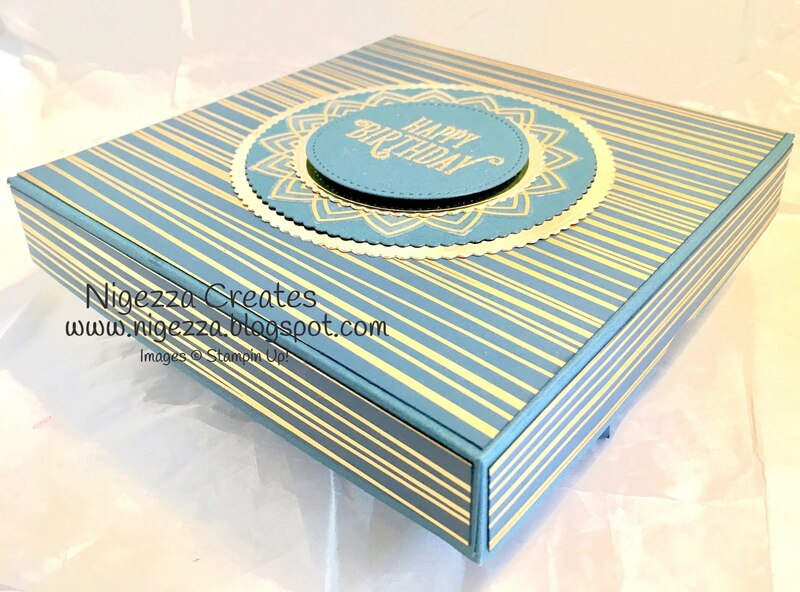 I decided to mat the speciality DSP instead of make the lid out of it because it had a white background and I wanted it all to be blue. This also meant that the mats had to be sponged with Dapper Denim Ink other wise the white would have shone and that would not have been a great finish. I also heat embossed a sentiment from Happy Birthday Gorgeous with Gold embossing powder and Versamark. I also used the Eastern Gold Vinyl Stickers and the Layering Circle Famelits and the Stitched Shapes Framelits. The extra 1/16 is what enables the lid to fit snugly over the base. 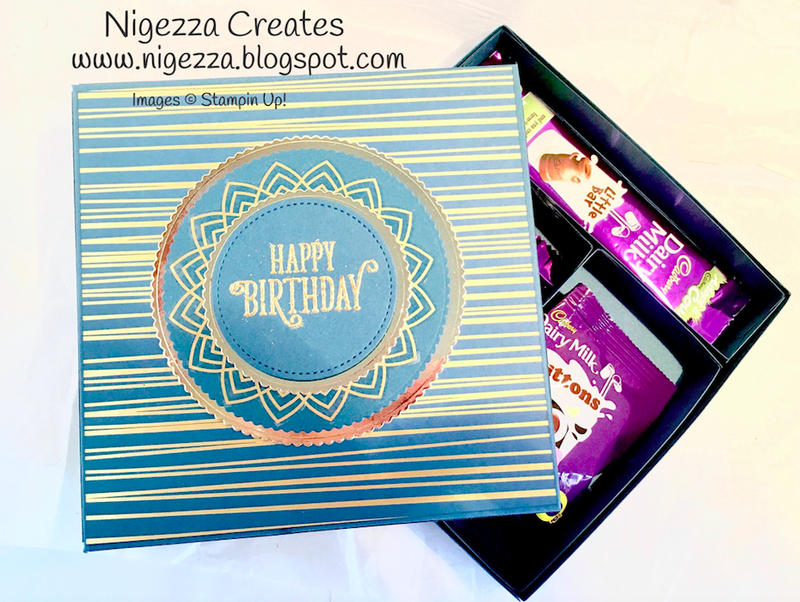 Of course the size of the inserts and indeed the box does depend on the chocolate bars you decide to put in. To get the measurements I just laid the bars on my grid pad to see what was the best lay out for the box, once I decided on this I needed to see what size the inserts needed to me.To so this I drew a rectangle border and added 7/8th of an inch to all 4 sides. As with everything like this I made a mock up to test it first - don't want to waste my precious card stock by making mistakes with it!